From the London Chronicle: We are beginning to suspect the authenticity of the French Crown jewels. Some months ago a portion was put up at a Covent Garden auction room, and was not sold; quite recently another portion was on view in New York; yesterday a corsage, set with numerous brilliants, rubies, emeralds, and sapphires, also a muff chain, set with diamonds and other precious stones, and other articles were offered at a Bond Street auction room, and also failed to find a purchaser. The corsage is an extremely ornate affair, a trifle too glorious for the ordinary wear of any person lower than a reigning sovereign. Its reserve price is said to have been 1,000 pounds. 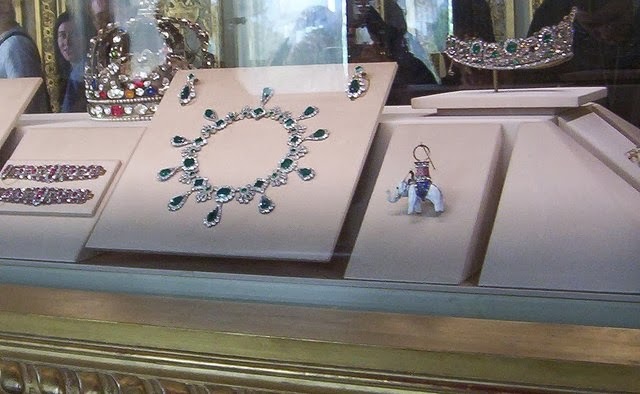 Note: For more on the nineteenth-century government sale of the French crown jewels, I'd recommend "The End of the French Crown Jewels" on this website. 1. Cropped version of a photograph available at Wikimedia Commons; source here.